For a moment I thought that I had missed one of Frost’s books, but it appear that this companion to The Secret History was actually published after the broadcast of season 3. Or at least, the book seems to come after the proceedings of that third season. I had not made the link, but the previous book is a dossier compiled by an “archivist” who is revealed in the book. Another archivist takes over and in the end the archive falls in the hands of the FBI where agent Tamara Preston investigated it. Preston is, of course, Tammy in the third season, the beautiful lady that joins the Blue Rose task force. 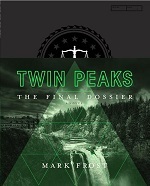 The Final Dossier is a little less of a dossier as the previous book. Gordon Cole asked Preston in the aftermath of the happenings in season 3 to investigate further. Preston compiled her findings and wrapped them up in some sort of novel-style, but in fact it is a dossier per person or event. In this way Preston fills the 25 years gap between the original series and the third one for several characters. There are dossiers about the Hayward family, Judy, Philip Jeffries, of course Dale Cooper, etc. Other characters are extensively written about in dossiers not specific to themselves. Much more than The Secret History, The Final Dossier put the events of the three series in perspective. A simple example, we learn when, how and why Dr. Jacoby left Twin Peaks and eventually returned to be Dr. Amp. Similarly Preston tried to reconstruct the whereabouts of “The Double” (‘bad Cooper’) and comes with some theories that are not apparent in the series. Similar clues can be found about Garland Briggs and his dealings with William Hastings and Ruth Davenport. Do not expect answers to all questions raised in the series or wrap-ups of all open story-lines of the third series, but Frost being one of the writers of the stories giving suggestions or even perspective himself, makes this book a pretty valuable source to try to make sense of things. Some things at least!